When I was 10 years old my Grandpa Ole took me on a trip from Minnesota to Montana where we camped for several days along the Yellowstone River and hunted for agate and jade, something I still remember like yesterday and the beginning of my interest in jewelry. When we returned to Minnesota my Grandpa started sorting the agates so that he could cut them on his lapidary saw to be later cut into cabochons for jewelry he created as a hobby, something he felt I had a natural ability for. 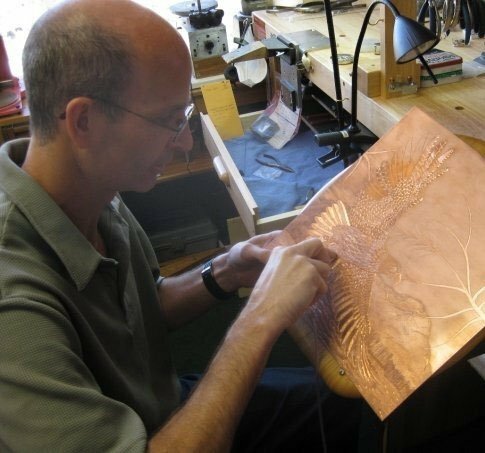 Eleven years later, at age 21 I started my 8 1/2 year apprenticeship to become a custom fine jeweler. I had a brilliant jewelry teacher who at 60 years old worked 15 hours a day, seven days per week, and he expected me to as well, but I didn't mind because I loved every minute of it! By age 29, I had learned nearly everything he could teach and in June of 1993 I decided to leave and go on my own.......yes, I probably should have stayed longer but something inside me just changed and I knew I wanted to try it on my own. It was very tough for about 6 months until I opened a Trade Shop doing the work for 9 other jewelers in Tucson and soon was working 7 days per week again doing as many as 75 jobs per day during Christmas. It was crazy but the money was great and I was able to increase my repair skill knowledge to equal my custom skills making me one of the better jewelers around which helped to get more and more difficult custom work. In 2008, I created my first ring worth over a million dollars. After closing my custom business back in April of 2013 I decided I wanted to pursue an online business full time knowing it would allow me to spend more time with my family and let me create my own designs, something I never had the time for before. Now, four years after closing my retail store I have started an online business making specialized tools and accessories to help people learn more about the many possibilities of both casting and mold making.